ANTARES (Astronomy with a Neutrino Telescope and Abyss environmental RESearch) is a European research collaboration which has constructed a neutrino telescope in the deep Mediterranean Sea off the coast of southern France. The detector consists of 12 vertical strings and an instrumentation line that are anchored to the seabed and tightened by underwater buoys. Each of the 12 telescope strings is composed of 25 storeys with 3 optical modules each and a total length of about 460 m. The detector instruments a total water volume of about 0.01 km3. The construction of ANTARES was completed in May 2008. The reconstruction of neutrinos is achieved indirectly with the help of Cherenkov light, which is emitted by charged particles, like electrons or muons, that are created in interactions of neutrinos with nuclei in the water molecules. Among the physics goals of ANTARES are the measurement of the diffuse cosmic neutrino flux, the precise measurement of the angular and energy spectrum of the neutrinos, the search for cosmic point sources and the search for signals of WIMPS and other exotic particles. The ANTARES group at ECAP is a collaboration member since November 2001. 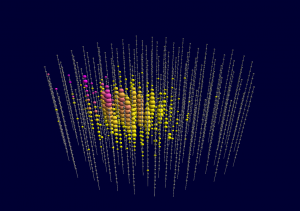 Our group participates in the development of efficient neutrino reconstruction techniques and studies the atmospheric muon background. Additionally, we are involved in various aspects of detector calibration and develop data-based methods to determine the absolute detector positioning which is essential to achieve high resolution track reconstruction. 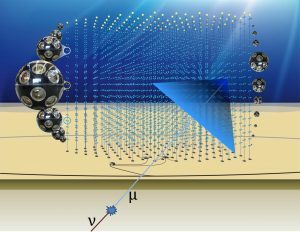 Another focus of our work is set on the development and investigation of acoustic neutrino detection methods for a future detector design. Artist’s view of the KM3NeT Observatory with a Cherenkov light cone induced by a muon. KM3NeT is a large distributed research infrastructure that comprises a network of deep-sea neutrino telescopes in the Mediterranean Sea with user ports for Earth and Sea sciences. The main objectives of KM3NeT are the discovery and subsequent observation of high-energy neutrino sources in the Universe (ARCA) and the determination of the mass ordering of neutrinos (ORCA). An array of thousands of optical sensors will detect the Cherenkov light in the deep sea that arises from charged particles originating from neutrino interactions. 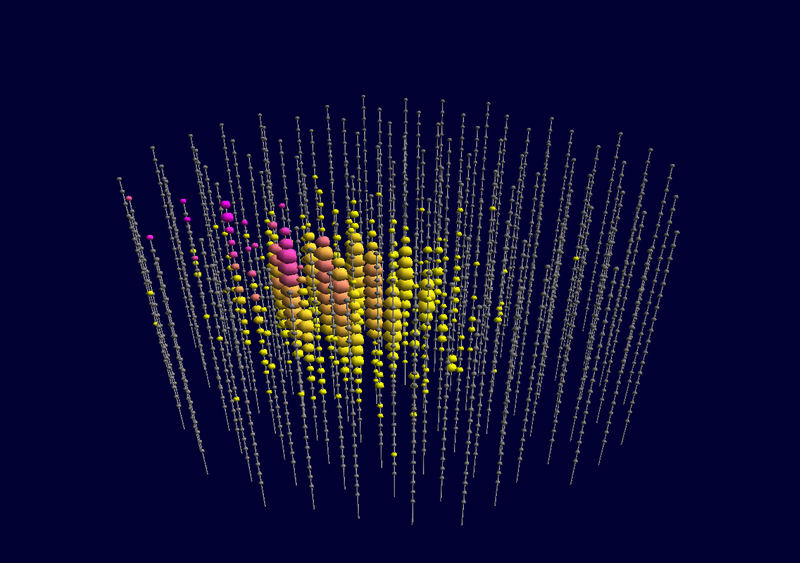 Simulation of a high-energy neutrino event in the KM3NeT-ARCA detector. The objective of ARCA is the detection of high-energy neutrinos of cosmic origin. The successful construction and operation of the ANTARES detector has demonstrated the feasibility of deep-sea neutrino telescopes. 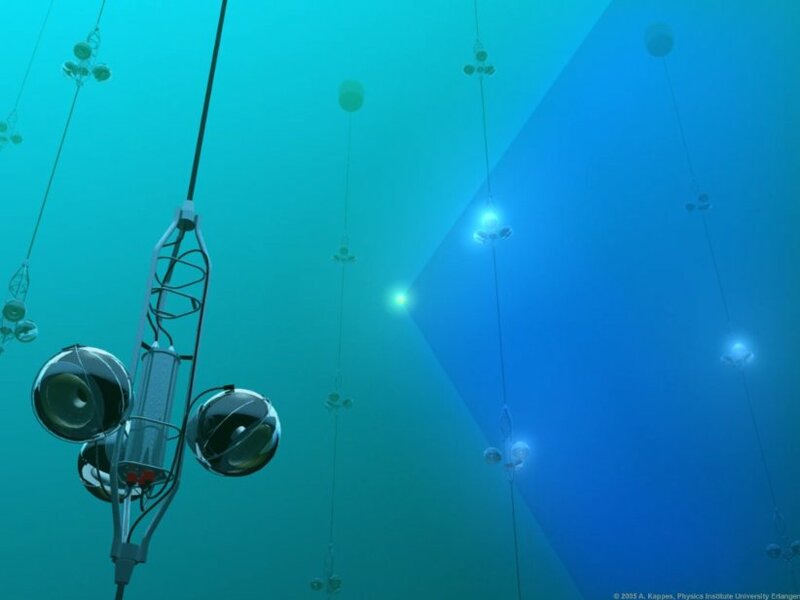 Furthermore, the transparency of the deep-sea water, the size of the detector and the geographical location make KM3NeT an ideal instrument to study sources of high-energy neutrinos in our Galaxy and beyond. Following the observations of cosmic rays and high-energy gamma rays, the questions remain which astrophysical objects accelerate subatomic particles to such high energies and which are the acceleration processes involved. 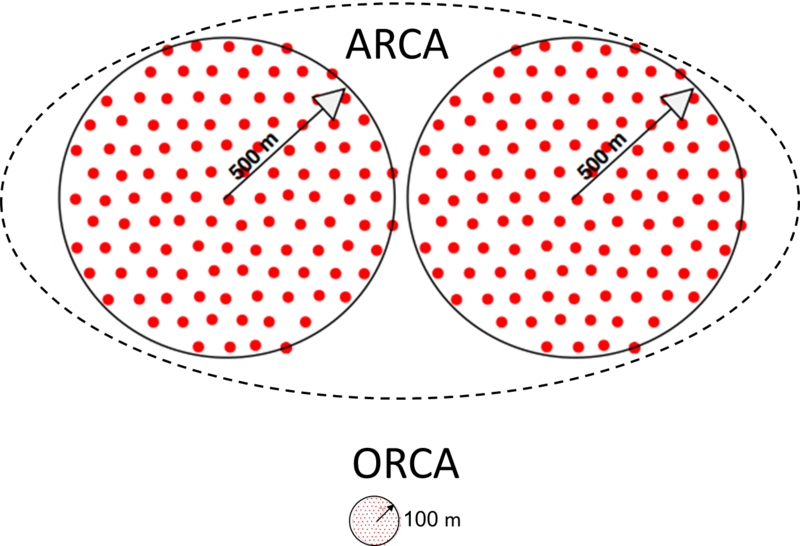 In answering these questions, one is confronted with the ambiguity of the production mechanism of gamma rays and the difficulty to point back charged cosmic rays. This impasse can be broken by the observation of high-energy neutrinos. The neutrino signal recently reported by IceCube motivates a multi-messenger approach in which astrophysical particle accelerators can be identified and studied through the combined observations of cosmic rays, gamma rays and neutrinos. So, the next challenge is to identify the sources of cosmic neutrinos. The layout and relative sizes of the phase 2.0 KM3NeT neutrino telescopes. The objective of the densely instrumented ORCA detector is the determination of the mass ordering of neutrinos. This so-called neutrino mass hierarchy is, together with the CP-violating phase and possible Majorana nature of the neutrino, an outstanding unknown of the Standard Model of particle physics. 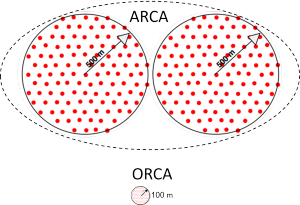 With the ORCA detector it is possible to determine the mass hierarchy by measuring the oscillations of atmospheric neutrinos that have transversed the Earth. The ORCA detector provides in addition competitive measurements of other neutrino oscillation parameters and sensitivity to low-mass dark matter (via annihilation in e.g. the Sun) and possibly also to the composition of the Earth interior (via neutrino tomography). For more information, please refer to the KM3NeT Homepage.